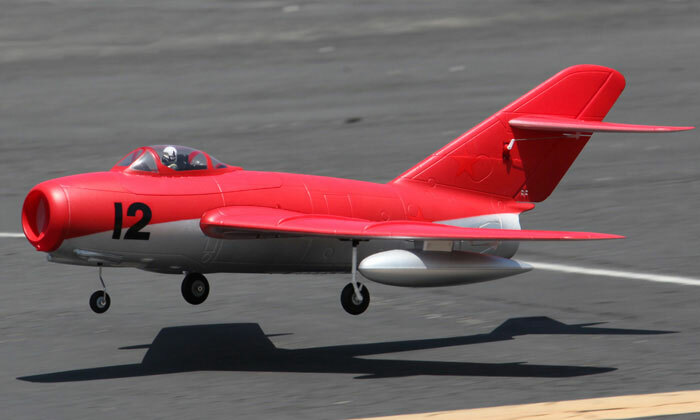 RC plane news, tips, help, information, product reviews and more from Nitrotek. New stock of planes to arrive soon! We are expecting a new stock of Dynam RC planes and Radio Controlled helicopters early next week. All your favourite models like EZ Hawk, its 4CH brother Hawksky and the ever so popular Spitfire (1200mm wing span) are on pre-order already, but we have some new models coming as well so keep your eyes peeled for news. 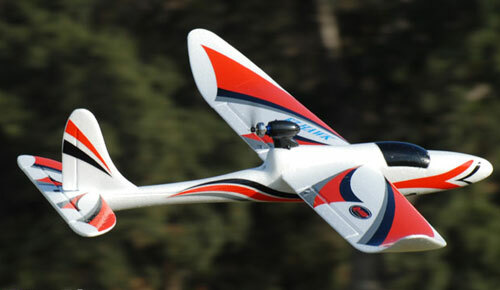 We have new arival of RC jets and RC palnes from Starmax, All the new model are RTF or ARF. One of the returning modeals is the F-14 Tomcat Jolly Rogers 6CH Twin EDF Top Gun RC Jet – RTF. As you can tell from the discription, the radio controlled jet is ready to fly this time (used to have them PNP), and the PRICE IS FABULOUS!!!! – Pre-Order at £289.99. This Nitrotek jet comes with a 2.4G radio which means the range is longer and more stable plus you do not have to worry about interference from other fliers. It is also equipped with a powerful brushless motor, for the best performance. The plane is made from strong but lightweight foam that is more resistant to crashes and gives easier stable flight even in windy conditions. This aeroplane can take off from the ground or can be hand launched. The F-14 Jolly Rogers is an extremely high spec model; it features twin 60mm EDF jets, twin ESCs and a massive 3200mAh battery, making it very quick. This plane is 80% assembled and so final finishes are needed before you can fly. Also everything you need is in the box, apart from 8 AA batteries, which you’ll need to power the radio contol transmitter. 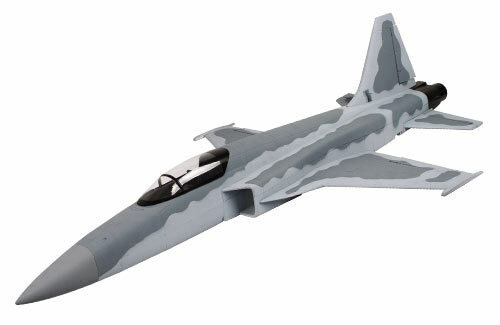 One of the brand new models is this replica MIG-15 70mm EDF RC Jet with Retracts 2.4GHz. 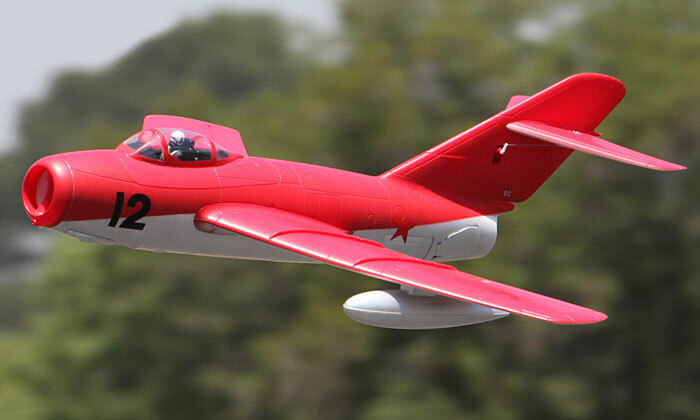 This Starmax replica of the MIG-15 is a top-level model aeroplane, featuring powerful 70mm EDF powered by a massive 2600KV brushless motor, retractable landing gear,10 installed servos including set for real air-brakes, the craftsmanship and factory finish that people come to expect from our models.The finish and design of this foam structured plane have been undertaken to a very high standard. The fuselage is both strong and extremely light, designed to withstand the occasional crash landing. 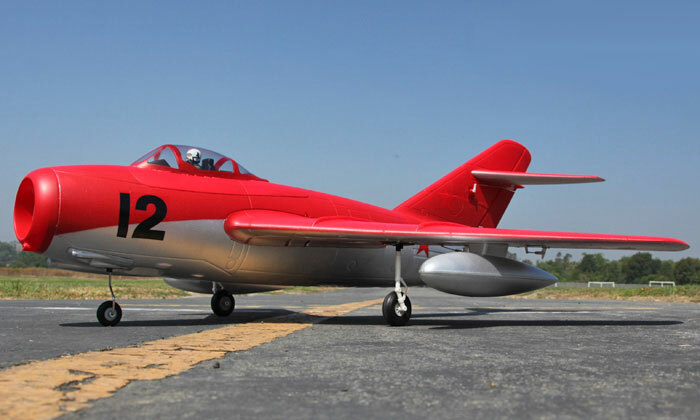 It is complete with a detailed paint job and factory affixed decals to complete the realistic look of your MIG-15. This is an amazing 3D aerobatic aircraft, capable of incredible speed and a full aerobatic display: inside loops, outside loops, axial rolls, inverted flight, knife edge, stall turns, hammerheads and spins are all possible. 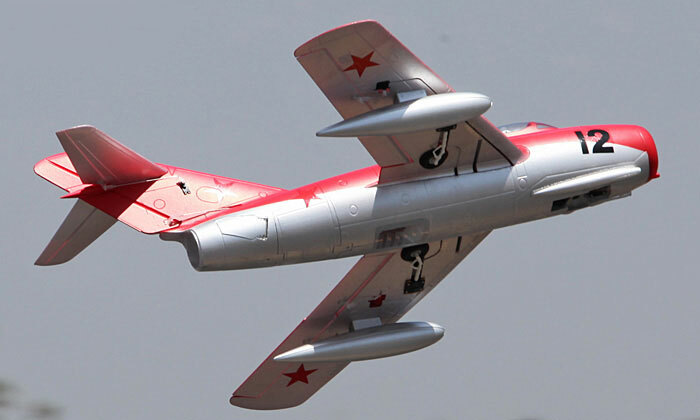 The MIG-15 RC Jet comes with working air brakes giving the model the ability to shorten takeoffs and slow touchdowns, just like the full-scale Mig-15! The jet is robustly build and extremely durable! Constructed of high quality durable EPO foam, best quality servos and very stable, smooth performance. In the first part I have been talking about Trainer RC Planes, Large scale remote control Planes and Warbirds. Today I have prepared my choice in the glider field and a great jet as well. The Sonic 185 is an excellent choice of RC plane for experience pilots, but will suit beginners too. The Sonic has a 1.85 metre wingspan and a powerful brushless motor with LiPo batteries. With this model you can turn off the motor, then soar down slopes and climb with the thermals to enjoy the experience of truly silent flight. Made from the same crash resistant foam material as other radio controlled planes in the Dynam range, the Sonic is factory finished, complete with a 4 channel receiver which allows full control of the rudder, elevator, ailerons and throttle. For easier transportation, the Sonic has a split wing design and a carbon fibre wing joiner. This F-5E is one of the highest spec and quickest jets on the market. It is a massive 1.3m in length and is fitted with a 70mm EDF engine; the extra power and speed is produced by the 40A brushless setup. As well as extra power and speed this jet also features an automatic landing gear system and turning front wheel. These highly maneuverable radio controlled planes can easily perform inverted flight, loops and rolls etc. The model comes pre-painted – Grey. The high power allows full aerobatic characteristics, the inside loops, outside loops, axial rolls, inverted flight, knife edge, stall turns, hammerheads, and spins are all possible. This is all about RC planes, Nitrotek has a great selection of radio controlled planes to suit all kinds of pilots, from beginners to advanced fliers. This is a great remote control plane for a novice wanting to start flying. Controls are easy to learn and you can alter the setting to make the plane more or less responsive depending on your skill level. It’s a great 4 channel RC plane, but you could use it as a 3 channel – just don’t hook up the wire for the wings and you get a basic flyer. I prefer to get going with the 4channel straight off, you can do rolls, inverted flight and loops! The standard battery that comes with the remote control plane lasts about 30 mins flying time. The plane is made of strong EPO foam and will take the good odd knock, but any straight fast dive into the ground and it will need a repair. The Transmitter works great, it’s a nice size and is a 2.4 gHz, so you get a good signal. The rc plane comes 95% complete; all you need to do is fix the tail section on, connect up the rods etc. and apply the decals – all takes about an hour (plus time for the glue to dry). 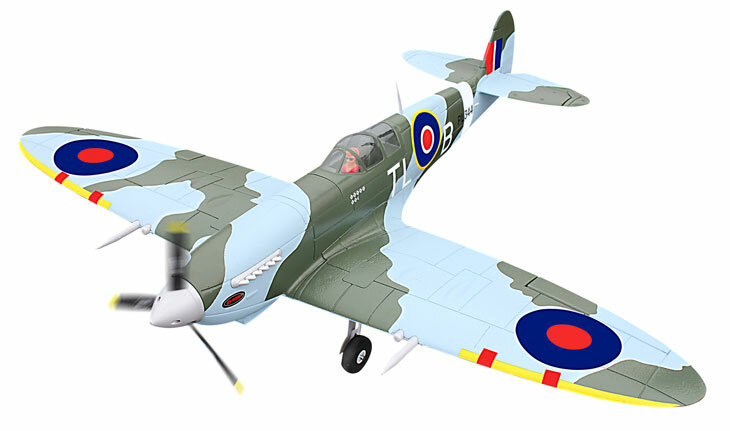 We have an extensive range of radio controlled planes in this category , I personally love the new Spitfire 4Ch RC Plane with Retractable Landing Gear 2.4GHz from Dynam. 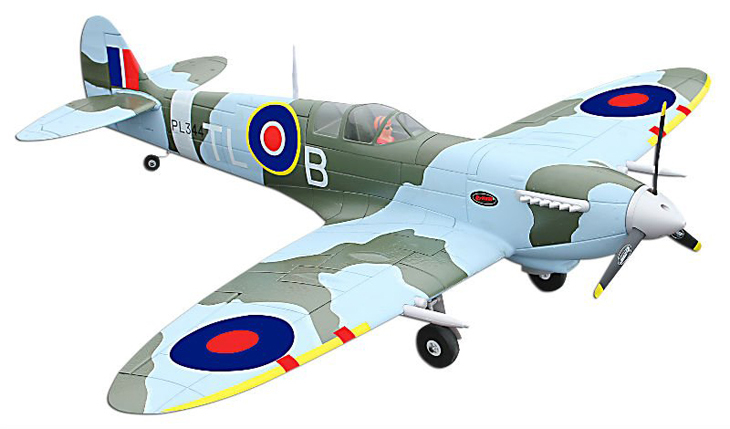 The new Spitfire 1200mm RC Warbird by Dynam comes with everything included. The 11.1V 2200mah li-po battery provides an impressive 18 minutes flight time between each charge.The high powered 1100KV Brushless motor and 3 blade propeller provide more than enough motive power to give stunning stability in all weather conditions! The all new working electronic worm drive retracts provide added scale realism and functionality that makes this rc plane stand out from the rest. Retracting the wheels after take off looks fantastic and will wow any onlookers. 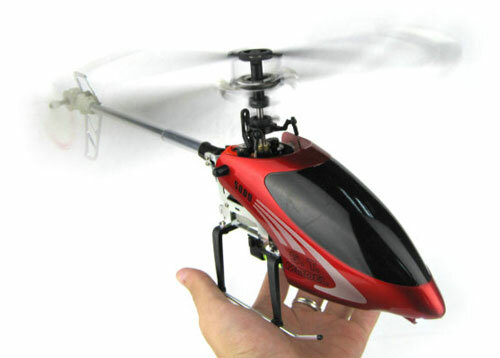 The model is ready to fly and great durability add a new dimension to this feature rich model. The remote control plane is made of highly durable EPO-foam for added durability. From the choice of large scale models I have picked a truly remarkable rc plane – the MX2 Green RC Plane. The MX2 Green we have here is a replica of the first one used in the first air race season in 2006 in Abu Dhabi. Starmax have pulled out all the stops with this one and it looks magnificent. With its sporting acrobatic pedigree this is a radio controlled aeroplane that will give the experienced pilot hours of grin factor entertainment. 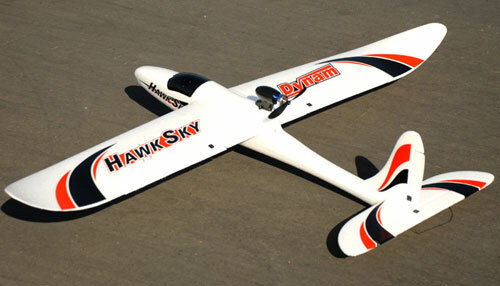 This is a large scale rc plane offering both great looks and additional stability in the air, even when it is windy. I think this gives you enough food for thought for now. I will have more on RC planes later this week, on gliders and Jets, so please stay tuned in. Nitrotek’s gift ideas for men and boys aged 14 to 16 are great fun and with the right care taken, will last forever. Some are in the form of a kit and need to be assembled before you run the model, but don’t worry the instructions are extensive plus we have excellent technical support team which will help them put the model together if they get stuck. On the other side we have gift ideas for men & boys that could be run straight out of the box. One way or the other our gift ideas are unforgettable, educational and fun. Here’s a great 4 channel radio controlled helicopter that would make an amazing gift idea for men & boys who love gadgets. This gift would suit people who have maybe had a twin blade helicopter before but are ready to take things to the next level. It’s suitable for 14-16 year olds as it is more of a challenge but more rewarding than the twin blade remote control helicopters that they may find to easy The single blade setup makes it more realistic and it flies like a real helicopter. Dynam’s EZ Hawk rc plane with its brushless motor is the perfect gift idea for men and boys. Only a small amount of assembly is required once the box is opened and they will by flying this glider in a matter of minutes! The EZ Hawk trainer is constructed from a durable EPO foam so it can take the knocks! This is fantastic gift idea that may start a new passion for RC planes and flying. This build it yourself nitro radio controlled car kit is one of our most popular gifts. Forget Lego etc., these self build kits provide hours of fun and when they are finished they are actually fun to use! For all of the hours of enjoyment your loved ones will get from first building and then racing these kits, they are amazing value for money. In particular these are a very popular Christmas gift as they will keep kids and big kids quiet while they build the models over the Christmas holidays. If you are looking to splash out then this is our highest spec electric radio control car. This model will make an ideal gift for men and boys interested in cars. These models are ridiculously quick and will deliver masive amounts of fun and joy. The Werewolf will go well over 50mph, and its upgradeable setup means this buggies potential is endless and so is your choice of next present. If you are looking for the ultimate gift idea then this ShengQi petrol powered Hummer is the ultimate boys choice. It’s big, fast and solidly built. It runs on a mixture of petrol and oil that can be bought from any petrol station. This is a beast with a massive feature list, an extreme petrol rc truck with loads of power that pushes these petrol trucks to speeds of up to 80 km/h! Look at similar petrol rc trucks the same specs on the market, they retail for over twice what we are selling these trucks for! This is the best ever gift idea for men and boys!! If after reading through our gift ideas for men you are still finding it difficult to find that perfect gift feel free to call us on 0161 88 300 54, let us know about the person the gift is for, and we will be happy to talk you through a few more gifts that should suit them. The warbird series has been expanded to include a scale replica of the ultimate British fighter the Spitfire,looks stunning just like a real plane. After months of flight testing and design work, Dyman has produced an aircraft that is very stable and capable of maintaining flight at very slow speeds that allow novice to master flight mechanics with ease. The new Spitfire 1200mm RC Warbird by Dynam comes with a 11.1V 2200mah li-po battery, providing impressive, up to an 18 minutes flight time between each charge. The high powered 1100KV Brushless motor and 3 blade propeller provide more than enough motive power to give stunning stability in all weather conditions! The new electronic worm drive retracts provide added scale realism, plug and play functionality and real durability add a new dimension to this feature rich model. The model is made of highly durable EPO-foam for added durability. We have selected a stunning colour schemes that show this aircraft off to the maximum. We have a new model to tempt you arriving on 17th September 2010, but it is available to pre-order now, saving you £10!! This is a twin engined and realistic looking airliner, and is unique as the only purpose built passenger plane in our range. It is powered by two powerful brushless motors, and comes with 2.4GHz radio equipment for the best in control. It is also supplied with a high capacity Lipo battery which will give you the longest flight times possible. This radio controlled model is a replica of the Douglas DC-3 – the aircraft whose range and speed revolutionised air travel, the plane was first flown in 1935 and remarkably some are still in service today! The famous C-47 Dakota military plane was also derived from this airliner, and enthuiasts like to paint this model in a livery faithful to its type, so you can make it look like a Skybus with the included decals, or create your own unique model DC-3 or a C-47 Dakota! Its looks make it stand out from the crowd, and its striking dimensions, with a wingspan of 57″ certainly mean this plane will be noticed. The Skybus is constructed from EPO foam, which does give it some durability and an element of crash resistance, which can be handy on those first few flights. Our popular EZ Hawk, Cessna EP 400 and Snowbird rc planes are now on their way to our warehouse and we should be shipping on or around September 17, 2010. To ensure you get yours you can pre-order on our web site now and save £10! The EZ Hawk trainer plane from Dynam proved to be a really fast seller, due to its suitability for learners, its ease of assembly and flight. This has been a very reliable plane too and has received some great reviews on our web site. The EZ Hawk powered trainer is constructed from a durable EPO foam, so it can take the knocks and crashes as you learn to use it to its full capability. The EZ Hawk is propelled by a powerful Dynam Speed 400 brushless motor run off a Dynam Brushless Electronic Speed Control (ESC). This combination of power and control makes it an excellent aerobatic craft. It also comes with a Li-Po battery and charger for longer flights. So why waste any time, visit our web site, order today and save £10!! Also next day delivery in UK mainland is free of charge! We’re still busy at Nitrotek with the process of updating the photographs of our products, the most recent one to get the treatment is from our range of electric ducted fan (EDF) jets. The models we sell are of a high quality build from the Starmax manufacturer, and they are finished to a level of difficulty not seen in other models of an equivalent price. Hopefully the pictures will show this! Here we have our 64mm 5Ch Alpha Jet in a camo colour scheme, this jet features a bomb which can be dropped using the fifth channel while the aircraft is in flight. The Dassault/Dornier Alpha Jet is a light attack jet and advanced trainer aircraft, jointly manufactured by Germany and France. It is the main rival of the BAe Hawk, although it hasn’t been made in as great numbers, it has been supplied to the French Air Force, Luftwaffe, Royal Thai Air Force, and the Portuguese Air Force amongst others. Being so light and powerful makes the Alpha perfect for aerobatics and is used by the Patrouelle de France flight demonstration team to spectacular effect. The Red Bull company also own an Alpha and use it for their own demonstration purposes, painted in their own livery. Starmax have worked their usual wonders in the finish and design of this foam structured plane. The fuselage is both strong and extremely light, designed to withstand the occasional crash landing. It is complete with a detailed paint job and looks ready for air to air combat. What all this adds up to is an exceedlingly rapid and nimble jet. In this model we have a 64mm ducted fan with powerful 14.8v battery, 5ch electronics controlling the aileron, rudder, elevator and the throttle. This gives you one of the fastest and most agile model aeroplanes on the market for this price. This plane will travel at speeds in excess of 100mph. You will not be disappointed! The fifth channel: that’s used for dropping a scale bomb! It’s not just the Patrouelle de France who can perform aerobatics in an Alpha; once you’ve mastered this jet you’ll be able to attempt stunts such as: inside loops, outside loops, axial rolls, inverted flight, knife edge, stall turns, hammerheads, and spins are all possible. If you’re really good you will be able to perform the famous ‘Cobra Manoeuvre’ with your Alpha. The Alpha Jet features: Pre-painted foam fuselage & wings; 90% assembled; Pre-installed electrics; CAD engineering quality; Stunning paintwork; 64mm electric ducted fan; State of the art components; 2.4G Transmitter; Can perform amazing aerobatics; Powerful batteries; Approx 15min flight time; Range: 1000m. This impressive EDF jet is available from our web site for only £169.99 inc VAT and UK next day delivery! Yes, you’ve guessed it we’ve taken some more warbird photographs. This time it’s the impressively sized Catalina boatplane, in USAF blue and yellow rescue plane livery. The Catalina was an American flying boat of the 1930s and 1940s, produced by Consolidated Aircraft. It was such a versatile aeroplane that it performed numerous functions during WWII, and was used by the Air Forces, Armies and Navies of many countries. Catalinas were used in anti-submarine warfare, patrol bombing, convoy escorts, search and rescue missions and cargo transport. It was the most successful aircraft of its kind and produced in greater numbers than any other flying boat. Some remained in military service until the 1980s and even today the Catalina continues to be used as an airtanker in some parts of the world. The Catalina has full four channel radio control allowing adjustment of the aileron, elevator, rudder, and throttle; it can even be steered when floating on the water. Yes, water! This model sea plane has been designed so that it can actually take off and land on water, the twin brushless motors it is powered with can send it soaring effortlessly from your local lake or pond, into the sky. With its wingspan of just over four and a half feet it really does look spectacular! The design of this aeroplane does not make it as agile as some other models, but it can pull a loop from a shallow dive and looks fantastic doing a low flypast either over land or water. In any case the power of the twin brushless motors enables it to be flown in many conditions, even when it is windy. The Catalina is nearly ready to fly straight from the box, all the necessary glue and tools are included in the in the carton and you will have it flying in no more than a few minutes. All you’ll need are 8 AA batteries for the transmitter. This model has been specified by Nitrotek with a powerful brushless motor, and a 2.4Ghz radio transmitter, making it a perfect choice for the enthuiast. We have also upgraded the charger from a standard one, to a balanced charger included in the price. This makes charging safer and better for the battery. You get all this from Nitrotek’s web site for just £149.99 inc. VAT. Having assembled this plane myself in order to take the photographs, I can honestly say that I was really impressed by the look of it, the detail and its size.